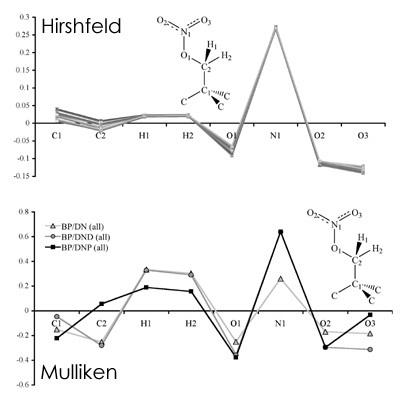 In the event anyone is trying to perform some type of post-SCF Mulliken charge analysis in DMol3 4.0, be warned! Or, perhaps, don’t sweat the crazy results. Much to my dismay (after installing 10 new copies), there is a reported bug (reference id=06090p1rq01 to Accelrys) concerning the reporting of Mulliken charges in DMol3 runs where, as far as I’ve seen, the first 10 to 12 Mulliken charges appear reasonable and the remaining charges are the same small number. Hirshfeld charges appear unaffected (and are consistent with the results from previous DMol3 versions). Why fret the lowly Mulliken analysis? While Mulliken charge/population analyses are famously basis set-dependent and have been shown to be of limited use in describing various chemical processes (see, for instance, this interesting article at www.aip.org, the very handy little reference at www.chamotlabs.com, a CCL discussion/post of it at www.ccl.net and, for good measure, my example for the molecular explosive PETN in a previous post), the difference-dipole method that was used in the solid-state analyses of HMX and PETN yielded the best answers with the crystal cell dipole moments generated from Mulliken charges (perhaps a case where they excel, but time and more calculations will tell). If, for some reason, you find yourself wanting to try this approach for predicting infrared intensities for the reproduction of THz spectra, use the previous version of DMol3 (3.2) or request an older copy of the Materials Studio CD and use the same license. More free press concerning the HMX paper in J.Phys.Chem. A. in the form of “THz spectrum yields to theory” in the Science and Technology Concentrates section of C&E News (February 6, 2006, Volume 84, Number 6, p. 25). ACS-only accessible if you’re not on a campus with a subscription. Incidentally, the editor who made us look good, Mitch Jacoby, also received some free press lately doing something I wish I was doing more often. Check’em out at www.thewayjewsrock.com.